Charters Court, our residential and nursing care home in Felcourt Road, East Grinstead was officially opened by MP for East Surrey Sam Gyimah. Situated next to Charters Village, our independent retirement village – Charters Court opened its doors last year but specially invited guests, representatives from the local business community and residents attended an official plaque unveiling. The home, which received a ‘good’ Care Quality Commission report in January, has 60 registered beds split into suites, each with its own wing and staffed by teams of carers, nurses and support staff. “We live in a place that is 95% green belt and we have to be careful of what we build. This is the sort of tasteful addition we need. We do need positive care-orientated development providing it is done in the right way,” Mr Gyimah told guests. “This facility is very impressive and I am particularly drawn to the dementia suite. Research shows that all of us, at some stage in our lives, will know someone who suffers with dementia. It is up to us as a community to help support these people. 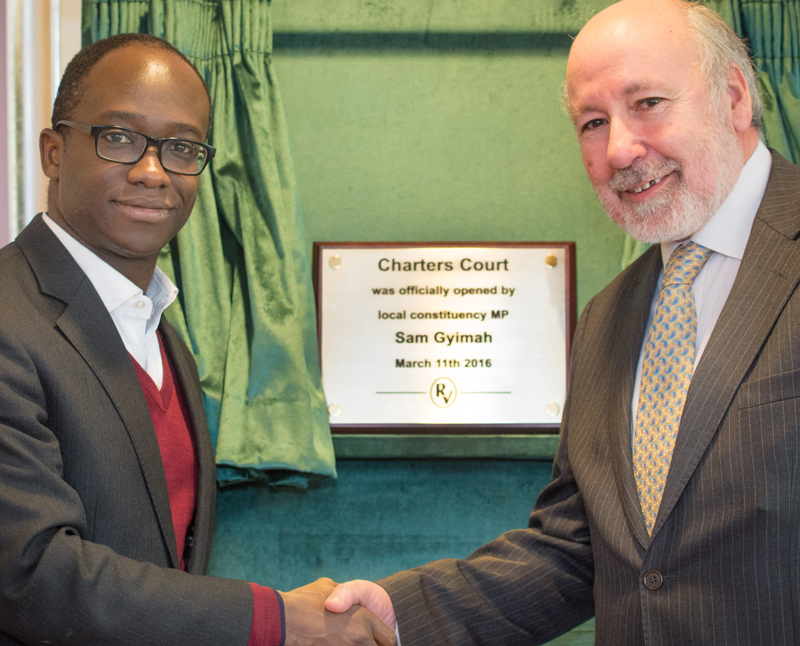 Mr Gyimah unveiled a plaque and was given a guided tour of both Charters Court and the independent living retirement village next door.